The world's foremost weather prognosticator has tens of thousands of fans coming to his doorstep on one special day of each year, has his long-range weather prediction mentioned in local forecasts around the globe on that day, and even has a ball held in his honor, along with numerous other celebrations. And, he and his predecessors have been around for centuries. Punxsutawney Phil, that "100 percent reliable " weather forecasting rodent from the little town just north of Pittsburgh that bills itself as the weather capital of the world marks his 127th year of forecasting on February 2. According to legend, one that goes back centuries by the way, the groundhog will predict six more weeks of winter if he emerges from his hole in the ground after a long winter's sleep and sees his shadow. If he doesn't see his shadow, spring is just around the corner. While the origin of the legend of the groundhog is uncertain, it can be traced back as far as Roman legions moving through what is modern day Germany. And it predates that period in history. The conquering Roman armies brought the tradition with them and the Germans picked it up, believing that if the sun shined brightly on Candlemas Day, an ancient festival marking the midpoint of winter, halfway between the shortest day of the year and the spring equinox, a hedgehog casting a shadow on that day would indicate six more weeks of winter. Go Winter, come not again. One of Phil's cousinsMany of Pennsylvania's earliest settlers were Germans, who brought their customs with them, including Candlemas Day, which was celebrated on February 2. But faced with an extreme shortage of hedgehogs -- they aren't native to North America -- and a profusion of groundhogs, the Germans easily switched allegiances to the larger animal they felt resembled the prickly little European insectivores. Actually groundhogs and hedgehogs aren't related. 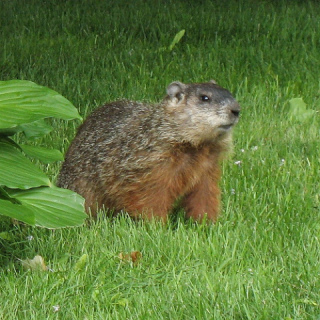 Groundhogs (Marmota monax) are burrowing herbivores that are covered with fur. Hedgehogs don't live in burrows, are covered with spines similar to a porcupine and eat insects. to see if the groundhog they called Phil would see his shadow. They've been hiking up that trail ever since. * Phil did not appear in the Hollywood movie "Groundhog Day," starring Bill Murray. An understudy was bought in, one that bit Murray on the finger three times. According to the Philadelphia Inquirer in 1993, the actor had requested Phil, whom he described as " ... very well-behaved, treated like royalty and a true professional." So, how accurate is he? In 127 years of weather forecasting, how accurate are Punxsutawney Phil's longrange (six-week) forecasts? To a man, the Inner Circle of the Groundhog Club claim that Phil is 100 percent accurate! Stay tuned. Groundhog Day ... and Phil's 2013 forecast ... is February 2. White Wombat -- The Unique Animal Video of the Day!! !